How many here think the "steel guitar" on "Little Pad" sound suspiciously like an electro-Theremin, or maybe a Mellotron/Chamberlin setting with the pitch knob manipulated (a la the slide guitar on the early version of "Strawberry Fields Forever")? The "backing track" version on Sunshine Tomorrow is revelatory. The attack of the plectrum on the string is very clear. I believe it to be a steel guitar. Wasn't Brian under pressure to record this record and get it out, pronto? Brian often created special sounds by way of instrument combinations. Would he and the engineer have burned up studio time trying to emulate a steel guitar sound on another instrument? Btw, the backing track is beautiful in its minimalism. That is definitely a lap steel guitar. No doubt on this one. As stated, you can hear the attack as the next phrase is started when the string is struck. What's just as interesting is that to my ears, I think you can hear on this specific track the cut-and-paste process of splicing tape and reusing the same "takes" for different sections of the same songs, as described by Jim Lockert in that famous quote where he spoke about the "marathon" mixing session which was done to finish the album. That lap steel part/phrase shows up three times on the final track. If you listen close, it's the same piece of audio spliced and copied three times to create the full track. Brian overdubbed different parts onto the same splice...just for fun let's call it a "sample". So basically what we're hearing is the 1967 fully analog precursor to digital sequencing and modern recording via DAW programs like ProTools or Cubase, where instead of playing tracks fully through or getting into summing and splicing after the fact, you'd get one section and do the analog tape splicing and copying version of the digital "copy and paste" process to make a full track. If you listen for it, specifically the backing tracks on Smiley and WH, you can hear it applied both albums, various tracks. It's pretty cool to think this primitive process which seemed to add stress to finishing the mixing for Jim Lockert later became perhaps one of the major functions and killer apps of digital recording programs like ProTools. And it's as easy as copy and paste today. My memory needs refreshing...could someone post or provide a link to Lockert's comments? Well, you would think, but he's not listed on the AFM contract for "Hawaiian Song" (which became part of "Little Pad"). Meaning, if he got paid, it wasn't through the AFM like the Beach Boys were. Was thinking the same thing, however no pedals are used to play this 8 bar phrase. Its basic non-pedal single string on this cut. I'm sure one of the band members could play it, however....the touch and intonation are dead on perfect, the way a pro steel player would play it. If anyone else is interested in reading them - I found a previous post by guitarfool2002, thanks! I'm sure it's one of the guys, otherwise why would the name of Vescovo or another pro not appear on the AFM contract, when the Boys' names do? All they'd have to do is rent a lap steel (or buy one, or borrow one), figure out the spots to slide to for each note, and mark those, then get one good take, then have Jimmy make tape copies and splice them together. Probably Carl did the playing, but maybe Brian. I tend to think Brian played a lot of parts on the Smiley tracks, due to recording with an 8-track, and the at-home nature of the sessions. Oh no doubt, like I said one of the band members (also thinking Brian or Carl) could have played it. But what the Sunshine Tomorrow backing track showed - and it was a beautiful surprise - was just how well played and well executed that 8-bar steel phrase really was. Whoever played it, the part as heard on the track is impeccable. Playing a non-pedal or pedal steel part perfectly isn't an easy chore. Just listen to the phrasing and the way the notes gliss and the pitches bend continuously...it's flawless, and the intonation is flawless too. 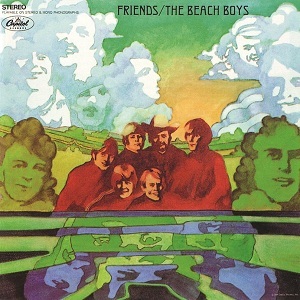 It would be a part which you'd expect a pro like Al Vescovo or Red Rhodes (choosing the two bigger names who worked with the Beach Boys in the late 60's) to execute...so if it were one of the Beach Boys, they did a fantastic job. It's not just about the notes, it's as much how you play the notes with all the inflections. With steel guitar, and using the bar, it's not just taping off where the bar needs to be like they did on the Electro-Theremin, it has a lot to do with having to get the bar exactly right to have that kind of perfect intonation, and with glisses like this, it can be tough. It's like hearing Jaco play fretless bass, then hearing a lesser player - The differences jump out, and it's all technique and feel. Speaking of Electro-Theremin, I also have been asking and wondering for years why they hired Paul Tanner to play that octave sweep on "Wild Honey" when one of the Boys could easily have done that on their own road version of the Electro-Theremin. So did Tommy Tedesco really play the ukulele on "Little Pad"? If he did, he wasn't paid for it through the union. There are an AFM contracts for "Hawaiian Song" and for "Little Pad" itself, but the only non-Beach Boy or BB associate (engineer or contractor) listed is Chuck Bergohofer, who contributed upright bass to what became part of "She's Goin' Bald". He's also listed on the contract for the alternate "With Me Tonight" several days earlier. Little Pad: Brian at piano, presumably Chuck Berghoffer is on there somewhere, and per Brian, Al Vescovo. Carl on Uke? Gettin' Hungry: Organ, sounds like Brian on Bass to me, guitars, maybe finally both Al and Carl? Whistle In: Piano, hard to tell who is on bass. Sounds like whoever it is that plays a lot on Wild Honey and Friends. But it could be anybody really. Seems like Brian played about everything to me. I really don't think Al or Dennis had a lot to do, other than sing. Really? Brian said Al Vescovo is on "Little Pad"? When and where was that? BTW, Vescovo's not on the AFM sheet. Neither is Berghoffer. To me, the electric bass on "Gettin' Hungry" sounds like it's played with a pick...therefore probably not Brian. More likely Al Jardine IMO. For "Whistle In", the AFM sheet lists only Brian and Carl (and engineer James Lockert and contractor Diane Rovell), so I'm thinking Brian on piano, Carl on bass. Brian said Al Vescovo is on "Little Pad"? When and where was that? Damned if I remember. I should have saved it. It was a fairly contemperaneous interview, I think, where the interviewer asked Brian to talk about Smiley Smile a little bit. I'll dig around to see if I can find the reference - however, Brian may very well have been confusing Little Pad with Diamond Head. There are sessions for "hawaiian song" on several days, I was under the impression according to Badman that Berghoffer was present at the July 21 session. Not that I can really hear any String Bass on Little Pad. That would certainly make sense...I just feel a little more panache in the little descending lines than I'm familiar with Carl having on bass. That was an interview from the earlier part of the 90's, where I can verify without any doubt that Brian DID credit Al Vescovo with playing lap steel on "Little Pad". The whole interview was posted once on this board a few years ago, so it probably still exists in full somewhere. Brian says a few lines about various Smiley tracks, nothing shocking - but interesting since he rarely talked about Smiley Smile's tracks. And why bother to plant seeds of doubt with Brian's memory on this topic of Little Pad? I don't understand that - give Brian at least some credit that he'd remember if Al Vescovo played steel guitar on Little Pad! . I had the full interview but I lost it - all I have are a few random quotes. BW:That was sort of a song about a cold winter scene. We tried to paint a picture of winter and then spring, but we called it fall. The idea was that it went to spring, late summer and then broke in the winter, We used the "Woody Woodpecker" theme because it was descriptive to us of spring and summer. And why bother to plant seeds of doubt with Brian's memory on this topic of Little Pad? Just considering all the angles. The steel on Little Pad seems basic enough for one of the Boys to handle, plus no Al on the AFMs. I tend to believe that Al was there, as to me the Steel seems nuanced enough to be a pro. But you kind of have to remain eternally sceptical of all possibilities in the "session credits" line of "work." Not to sound cheeky here, but I doubt the Boys could have tuned the steel guitar the proper way without asking someone, let alone have played such a smooth and as you said "nuanced" slide part that remained perfectly in tune. That's the real bear on that instrument - intonation. On a related note, the octave-slide "Theremin" line on the song Wild Honey sounds simple enough that I could teach any non-musician how to play it on Mike's "Ribbon Controller" in 30 minutes. Yet, they called in Paul Tanner, the pro, to do that part. Probably for similar reasons as they called Vescovo to play that steel on Little Pad. It's what I mentioned in that Feb 2006 discussion, an interview with Brian Wilson where he discusses Smiley Smile, and goes track by track. I only had available a few quotes from the larger piece, like the Fall Breaks description...but the rest sadly is lost and has been lost since a hard-drive crash years ago. So does ANYONE have a transcript of this specific BW interview where he talks about Smiley Smile? It is - if our memories were correct in 2006 and correct in late January 2019 - the source for Brian crediting Al Vescovo for that steel guitar part on Little Pad. I corresponded with Al Vescovo briefly before he passed away. he said it was him on Little Pad. as for lap steel vs. pedal steel, Al was almost exclusively a pedal steel player. by the mid/late 60s most guys who started on lap steel had switched to pedals. you can play pedal steel without ever hitting a pedal, and for something as simple as the part on Little Pad, there would be no reason to use a pedal. even on Diamond Head there is no discernible use of pedals, it's a Hawaiian/lap steel sound he's going for... but he's most definitely using a pedal steel on that one too. I could have sworn it was Lyle Ritz on the ukulele for Little Pad. Very cool! I thought it was Lyle aka "Ukulele Lyle" Ritz on the track too but could be wrong. (PS - Anyone unfamiliar with his solo recordings, check out Lyle's catalog of jazz uke albums and recordings...Besides being a studio bass legend, he's regarded as one of the best uke players if not a pioneer for bringing the jazz idiom to the instrument). What a lot of guys would do in the studio if asked for a "Hawaiian" sounding part, and they had a pedal steel, would be to simply use their C6 neck and copedant on the pedal steel and as you say, not engage any of the pedals since that's not the sound being asked for - However, there were and are times when an authentic lap steel sound and feel are required, and they can simply pull out an old Epiphone, Gibson, Rick, or Fender Stringmaster as needed for those sounds and tones. There are no pedals used on Little Pad or Diamond Head, obviously. What's interesting is if it were a pedal steel played on C6 or some equivalent, or if it truly were a lap steel heard on the tracks. RIP Al, he was a virtuoso. all due respect, i'd challenge you or anyone to do a blindfold test and tell the difference between a vintage lap vs. pedal steel, tone-wise. they can both be played like a lap steel and there is no discernible difference in the sound they make. Al is using pedals on Diamond Head, just not in the way we're used to hearing. the pedals on C6 pedal steel are used primarily for getting different chords. we are used to hearing the other neck, tuned to E9 in most cases, where the pedals are used more for melodic bends and licks. that's why the pedal steel on Cottonfields (played by Red Rhodes) sounds so different than Al's steel on Diamond Head. Red is on the E9 neck, Al on C6. I'd take that challenge. It has much to do with the pickups. I can hear a Fender Stringmaster's tone versus an Emmons, let's say. I used to own a 1940 Epiphone lap that had a very distinct pickup and sound...different from 40s Fenders and Ricks. I also have an early 70's MSA 12 string (tuned extended E9) and a 70's Sho Bud LDG tuned E9 with a slight knee lever mod of my own..when you know the tone, you can hear it. Like a strat versus a Paul. You don't hear Al doing any of the pedal moves people normally associate with pedal steel on these Hawaiian tracks. That was my point. As you said, what Red played on E9 is more associated with what people think of with pedal steel. *Al Jardine posted on Instagram the other day that Tommy Tedesco played ukulele on "Little Pad". Seems like maybe the sheets are wrong for some of these sessions? Seems odd that Al and Brian would have such specific memories about this track that are wrong. Was there actually any more to Hawaiian Song? Or was it just an early working title for Little Pad under which that one section was recorded? Who knows...I wish the session tapes were revealing, but they apparently aren't (so I'm told). All I can say is, if Tedesco and Vescovo were on those Smiley sessions, they weren't paid through the union, the way the Boys and Bergofher were, and it makes no sense to pay those two differently. In the case of Little Pad, both Brian Wilson and Al Vescovo have said in interviews that Al was on the session - That's pretty strong evidence for both of the two most key members involved in that session to confirm the same answer. Perhaps the missing names on the AFM sheets could be a case of paying under the table? It's the most plausible and simple way perhaps to explain the omissions. Tax-free money in pocket. As far as Tommy Tedesco playing uke, according to Al Jardine...This one I'm not outright disputing Al because we really don't have any audio evidence or otherwise, but I just assumed for years it was "Ukulele Lyle" Ritz playing the part, since he was a virtuoso ukulele player first, and second he seemed to be a lot closer to Brian's sessions and played more of them especially in 65-66-67 than did Tommy. But again, who knows short of more info. And not that it's evidence to back anything up with Little Pad, but less than a year later Brian called in both Lyle and Al Vescovo to play on another of his Hawaii themed tracks. I will say too that Lyle's fame was as a jazz uke player, and the chords played on Little Pad have some pretty juicy jazz voicings versus someone not as well versed in playing jazz on the instrument. I could be wrong, but I thought the lawsuit was settled by the time they were recording the Smiley album. Edit: yes, the lawsuit filed earlier in 1967 was settled by Capitol by July 1967 which is how Brother Records was the label for the Heroes single, etc. Capitol distributing Brother was part of the settlement. Don't know the exact date - Wikipedia only says the lawsuit was launched by the group in February, and was resolved by the time "Heroes And Villains" was released as a single in July. "Little Pad" was tracked in June. Powered by SMF 1.1.21 | SMF © 2015, Simple Machines Page created in 1.024 seconds with 21 queries.